CLYDE POULIN was born in Harrisburg, PA in 1955, the middle child of three sons. Following high school, he attended the University of Pennsylvania, where he studied music, and specialized in both keyboard and guitar. In college, he was a member of the band, Night Train and, while playing a show in Albany, NY in 1976, met a fellow band called the Roadhouse Sons. Asked by Cameron Walsh to fill in for an ailing band member, Clyde was soon hired full-time as a replacement. Like Evan, once bitten, he’s been with the band ever since. 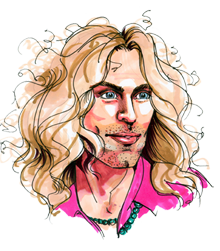 Clyde cites Led Zeppelin as his strongest musical influence and responsible for his personal style. He’s occasionally mistaken for Robert Plant, a fact that aids him in his efforts to leave the masses with a very favorable impression. Clyde has learned to capitalize this Doppelgänger success by squeezing his body into the tightest possible shirts and jeans, the latter of which are selectively and suggestively torn, and assist in maximizing the effect of carefully orchestrated gyrations. That alone ensures the Roadhouse Sons top-shelf booze from the waitresses, and several other unmentionable perks. 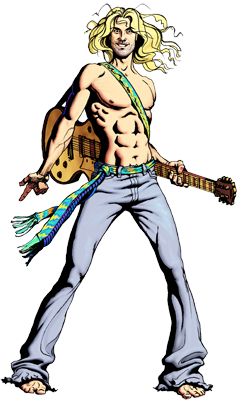 An accomplished guitarist, Clyde enjoys playing the keyboard while alone (and for the band, when necessary) and his interests include horseback riding and consuming any kind of seafood.